What would it be like to slice hundreds of juicy fruit and never clean up the mess? Wonder no more – Fruit Ninja VR is here! With dual swords play through the modes that billions of players have enjoyed on mobile. Slice your way to a high score in Classic mode, get the party started in Arcade mode, or relax in Zen mode. Exclusive to Fruit Ninja VR is the brand new Survival mode, which lets you face off against fruit-firing helicopters! The swords will allow you to juggle, skewer and flick fruit, and even deflect bombs! Are you ready for a virtual reality experience like no other? Play Fruit Ninja VR now! Classic Mode - Slice fruit and avoid bombs. Simple and sweet! Zen Mode - 90 seconds, all fruit, no bombs. A great way to relax and reach enlightenment or hone your ninja skills. So much more than slicing fruit! Step into the Fruit Ninja universe and tackle fruit from all angles - just don’t hit the bombs! 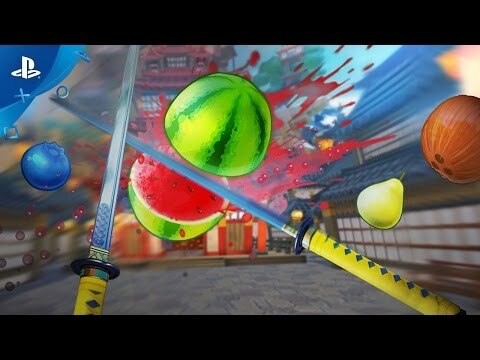 Take your ninja skills to the next level by slicing, juggling and skewering fruit in virtual reality. Hit huge combos, deflect bombs with a flick of the wrist, and stake your claim on the leaderboards or relax with some Zen Mode.